Kinetics and equilibria of axial ligation of bromomethyl(aquo) cobaloxime by a series of straight chain primary amines (methylamine, ethylamine, propylamine, butylamine, pentylamine, hexylamine), cycloamines (cyclopentylamine, cyclohexylamine, cycloheptylamine) and secondary amines (N,N-dimethylamine, N,N-diethylamine) have been measured as functions of pH by spectrophotometric technique in aqueous solution, ionic strength 1 M (KCl) at 25°C. The rate of substitution of H2O varies with the pKa of incoming ligand, thus establishing nucleophilic participation of the ligand in the transition state. Binding and kinetic data are interpreted based on the basicity and steric influence of the entering ligand. To compare the rate constants of the entering ligands, pH independent second-order rate constants (kon) are calculated. A bimetallic nickel(II) complex with the ligand Hsalamp (2-[(4-methyl-pyridin-2-ylimino)-methyl]-phenol), having the molecular formula, Ni2C26H22 N4O10Cl2, is synthesized and characterized by elemental, UV-Vis, IR and EPR studies. The IR spectrum confirms the presence of coordinated perchlorate ion and the UV-Vis. spectrum substantiates that the geometry around the metal ion is distorted square pyramidal. In the solvent methanol, the complex undergoes dissociation indicating the nature of the complex to be 1:2 electrolyte. The single crystal EPR studies indicate that the zero-field splitting is not large and the spectra can be observed even at room temperature, not so common for a nickel(II) ion. The spin Hamiltonian parameters calculated from single crystal rotations are:g - 2.377, 2.219, 2.071 and D - 9.7, 4.2 and -13.9 mT. Optical and electron paramagnetic spectral data have been used to obtain the parametersDq,B andC. Some new hydrazinium 2-pyrazinecarboxylate and 2,3-pyrazinedi-carboxylate salts of the formulae N2H5pc, N2H5pc.H2O (Hpc = 2-pyrazinecarboxylic acid), N2H5Hpdc, (N2H5)2pdc.H2O and N2H5(Hpdc).H2pdc (H2pdc = 2,3-pyrazinedi-carboxylic acid) have been prepared by neutralization of aqueous hydrazine hydrate with the respective acids in appropriate molar ratios. The free acids and their hydrazinium salts have been characterized by analytical, IR spectroscopic and thermal studies. IR spectra of all the salts show N-N stretching frequencies of the N2H5+ ion in the region 975–960 cm-1. The thermoanalytical behaviour of the free acids and their salts has been investigated by simultaneous TG and DTA. While pyrazinecarboxylic acid shows single-step endothermic (229°C) complete decomposition, pyrazindi-carboxylic acid shows exothermic decarboxylation followed by identical endothermic decomposition as that of the former. Similarly, salts of the monocarboxylic acid show endothermic effects during pyrolysis, whereas salts of the dicarboxylic acid show endothermic followed by exothermic decomposition. The acids and their salts both undergo complete decomposition to gaseous products. Phenol is nitrated regioselectively by fuming nitric acid inside the cages of faujasite zeolites (dependent on the loading level) and a remarkable ortho-selectivity is observed in solid state nitration. Toluene and chlorobenzene also containing ortho-/para-orienting substituents, undergo faster nitration, though the regioselectivity is less significant in zeolite media. The results are explained on the basis of diffusion and binding of phenol inside zeolite, which facilitate regioselectivity (and which is absent in toluene and chlorobenzene). Other advantages of employing zeolites as media for mild and selective nitration are also highlighted. The rates of photooxidation of thymine in presence of peroxydisulphate (PDS) have been determined by measuring the absorbance of thymine at 264 nm spectrophotometrically. The rates and the quantum yields (φ) of oxidation of thymine by sulphate radical anion have been determined in the presence of different concentrations of caffeic acid. Increase in [caffeic acid] is found to decrease the rate of oxidation of thymine suggesting that caffeic acid acts as an efficient scavenger of SO4•- and protects thymine from it. Sulphate radical anion competes for thymine as well as for caffeic acid. The rate constant of sulphate radical anion with caffeic acid has been calculated to be 1.24 x 1010 dm3 mol-1s-1. The quantum yields of photooxidation of thymine have been calculated from the rates of oxidation of thymine and the light intensity absorbed by PDS at 254 nm, the wavelength at which PDS is activated to sulphate radical anion. From the results of experimentally determined quantum yields (φexpt1) and the quantum yields calculated (φcl) assuming caffeic acid acting only as a scavenger of SO4•- radicals show that φexpt1 values are lower than φcl values. The φ ’ values, which are experimentally found quantum yield values at each caffeic acid concentration and corrected for SO4•- scavenging by caffeic acid, are also found to be greater than φexpt1 values. These observations suggest that the thymine radicals are repaired by caffeic acid in addition to scavenging of sulphate radical anions. Oxidation of meta- and para-substituted benzylamines by cetyltrimethylammonium permanganate (CTAP) to the corresponding aldimines is first order with respect to both the amine and CTAP. Oxidation of deuteriated benzylamine (PhCD2NH2) exhibited the presence of a substantial kinetic isotope effect (kH/kD = 5.60 at 293 K). This confirmed the cleavage of an α-C-H bond in the rate-determining step. Correlation analyses of the rates of oxidation of 19 monosubstituted benzylamines were performed with various single and multiparametric equations. The rates of the oxidation showed excellent correlations in terms of Yukawa—Tsuno and Brown’s equations. The polar reaction constants are negative. The oxidation exhibited an extensive cross-conjugation, in the transition state, between the electron-donating substituents and the reaction centre. A mechanism involving a hydride-ion transfer from the amine to CTAP in the rate-determining step has been proposed. Kinetics of oxidation of five vicinal and four non-vicinal diols, and two of their monoethers, by tetrabutylammonium tribromide (TBATB) has been studied. The vicinal diols yield products arising out of glycol-bond fission, while the non-vicinal diols produce the hydroxycarbonyl compounds. The reaction is first-order with respect to TBATB. Michaelis-Menten type kinetics is observed with respect to diols. The reaction fails to induce the polymerization of acrylonitrile. There is no effect of tetrabutylammonium chloride on the reaction rate. The proposed reactive oxidizing species is the tribromide ion. The effect of solvent composition indicates that the rate increases with increase in the polarity of the solvent. The oxidation of [1,1,2,2-2H4] ethanediol shows the absence of any primary kinetic isotope effect. Values of solvent isotope effect, k(H2O)/k(D2O), at 288 K for the oxidation of ethanediol, propane-1,3-diol and 3-methoxybutan-1-ol are 3.41, 0.98 and 1.02 respectively. A mechanism involving a glycol-bond fission has been proposed for the oxidation of vicinal diols. Non-vicinal diols are oxidised by a hydride-transfer mechanism, as they are monohydric alcohols. 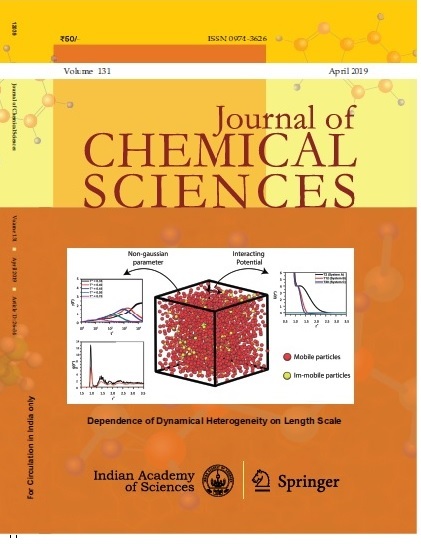 Density and refractive index have been experimentally determined for binary liquid mixtures of hexadecane and heptadecane with 1-butanol, 1-pentanol, 1-hexanol and 1-heptanol at 298.15, 308.15 and 318.15 K. A comparative study of Lorentz—Lorenz (L-L), Weiner (W) and Heller (H), and Gladstone-Dale (G-D) relations for predicting the refractive index of a liquid has been carried out to test their validity for the eight binaries over the entire mole fraction range of hexadecane and heptadecane at the three temperatures. Comparison of various mixing rules has been expressed in terms of average percentage deviation. The performance of the Lorentz-Lorenz and Heller relations is relatively better than that of the Weiner and Gladstone-Dale relations.